Back to Work, But First . . .
It’s time to get back to work. After the Blogging from A to Z April Challenge, I decided that my blogging assistant/human mommy had earned a little time off. Who knew that blogging every day except Sundays for an entire month could be so hard? Our hats are off to those of you who manage to keep up that type of schedule. You are true blogging ironmen/women/animals. Mommy and I spent our off time doing . . . well, I’m not really sure what we did; however, I do know that it’s time to get back to work, but first . . .
. . . 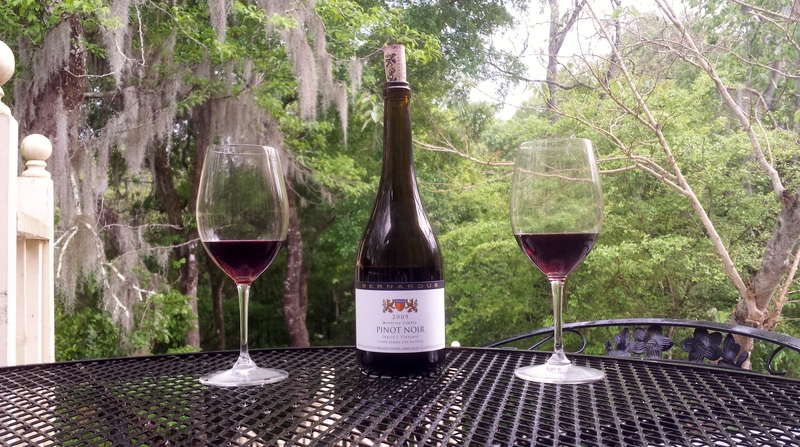 I have a few pictures to show you from our recent mini-vacation. 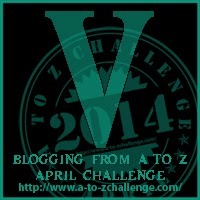 I shared some photos in my “V is for VACATION” entry for the A to Z Challenge. 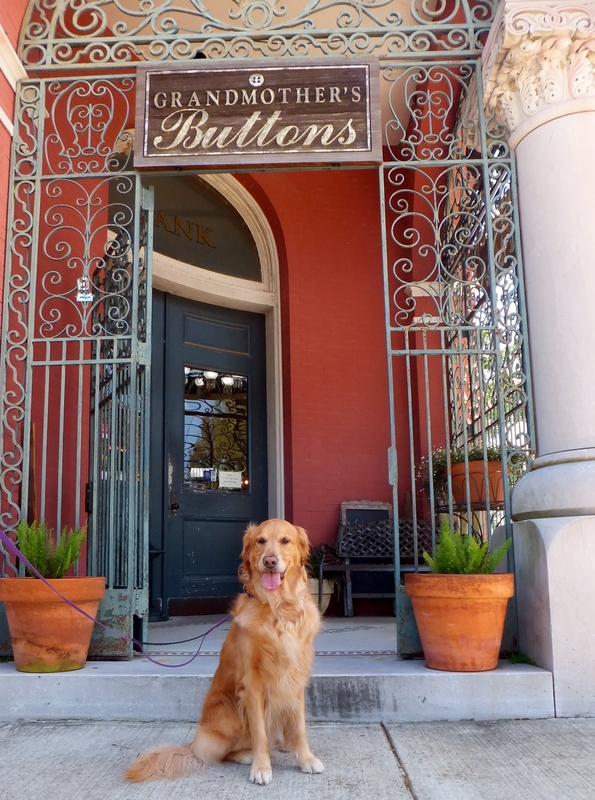 Normally when my humans and I visit Butler Greenwood Plantation and Bed and Breakfast, we spend all of our time just relaxing at the B&B; but this time we decided to venture into the little town of St. Francisville for an afternoon tour. Our first stop was a little shop called Grandmother’s Buttons. My human daddy and I stayed outside while Mommy went in to shop. The talented people at Grandmother’s Buttons make beautiful jewelry out of vintage buttons. Their St. Francisville store and workshop are housed in a restored 1905 bank building, and their creations are sold online and in stores around the world. From Grandmother’s Buttons, we made our way to Our Lady of Mount Carmel Catholic Church and the bluff overlooking the Mississippi River. It was quite an uphill hike to reach the church site and the day was slightly warm, so I was somewhat tempted to jump into the beautiful fountain, but I managed to refrain. 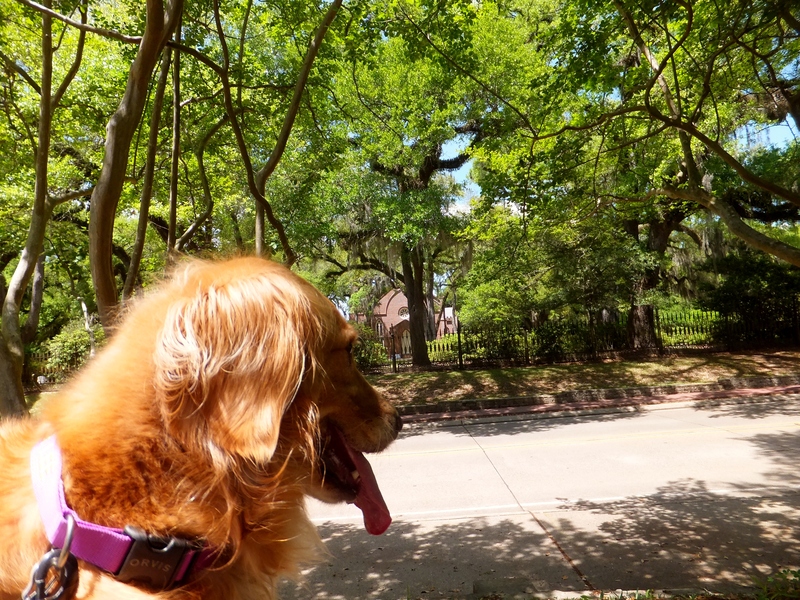 We continued our tour with a leisurely stroll down one of St. Francisville’s historic tree-lined and, thankfully, shady streets. Finally, we took a little walk around the West Feliciana Parish Court House, which was built in 1903, before heading back to the B&B for more R&R. So now the break is over and it’s back to blogging for my mommy and me. Looking forward to catching up with all of our friends and sharing photos and reflections from our adventures. 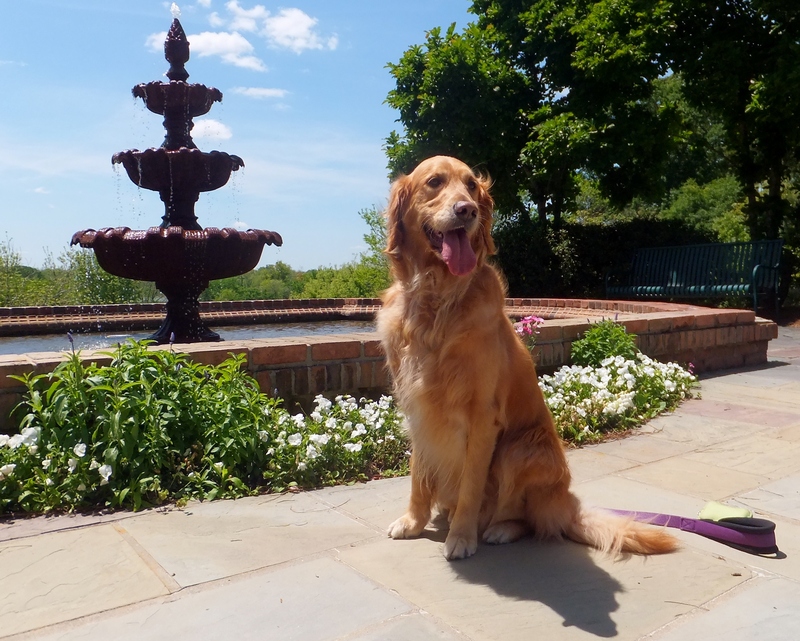 Even Golden Retrievers need a little vacation every once in a while. My humans like the kind of big vacations that involve airplanes and ships, while I prefer not to fly or sail. I enjoy loading my chariot–actually, I enjoy watching my humans load my chariot–and then hitting the road for a little close-to-home R&R. 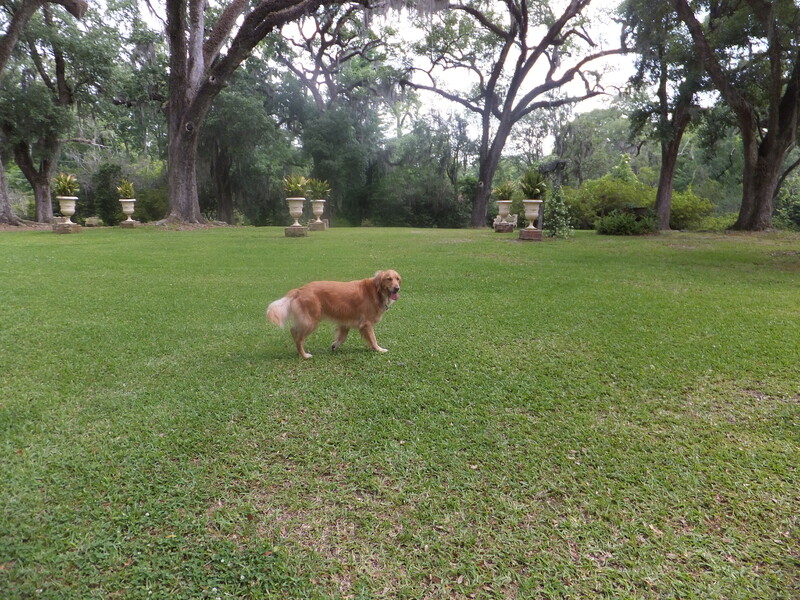 Last weekend, we took a short drive north to one of my very favorite mini-vacation spots: Butler Greenwood Plantation and Bed and Breakfast in St. Francisville, Louisiana. This was my fourth visit to Butler Greenwood, and I love it more and more every time I go. This bed and breakfast is what vacation is all about: really getting away from it all. On their last big trip, while they were somewhere in the middle of the ocean doing absolutely nothing, my humans started to feel a little guilty. Were they being a little too lazy? And that’s when a very wise lady explained the difference between travel and vacation. Travel involves visiting new places, seeing new sites, experiencing new cultures. Vacation involves resting and relaxing . . . nothing more . . . that’s it. I like vacation. 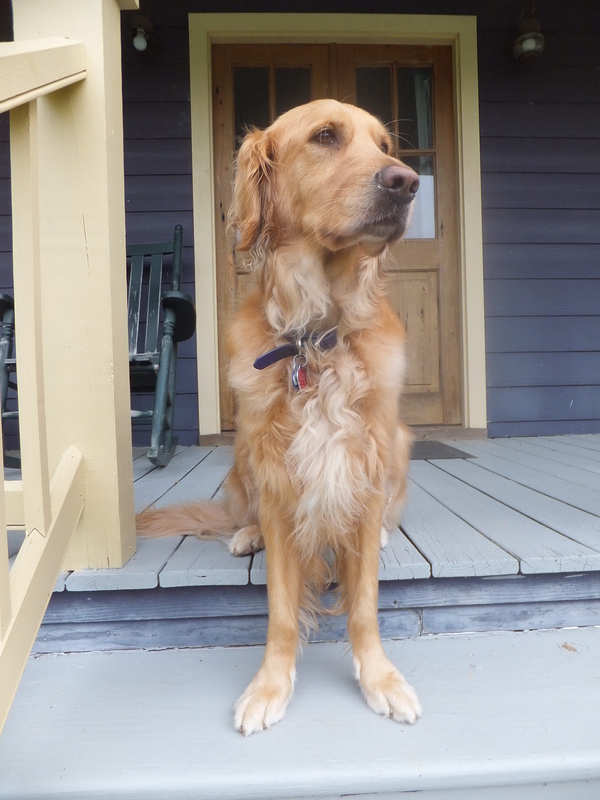 After we had settled into our little cottage vacation home and explored the beautiful B&B grounds, my humans really started to relax . . .
. . . while I sat on the back deck and stared down at the lovely ravine below. 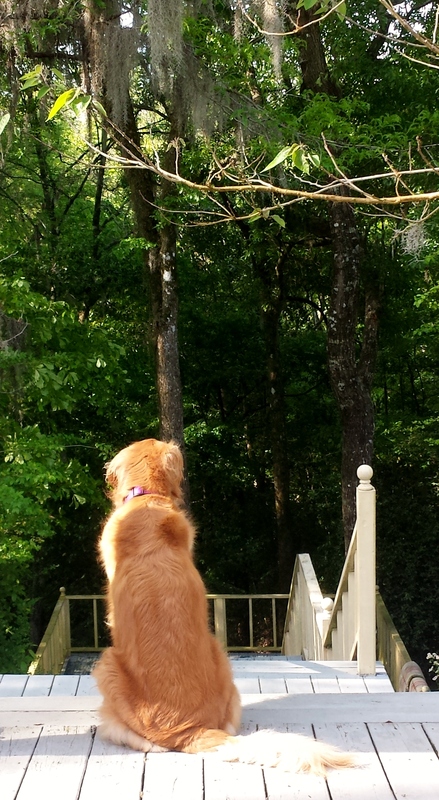 And that’s pretty much how we spent the next two days of our mini-vacation . . .
. . . my humans lounging and gazing lazily through the treetops . . .
. . . and me resting my head and staring off into the distance. It was everything a vacation should be. In terms of quality, this photo is not all that fabulous. In fact, my human mommy did a little editing to it to make it somewhat more interesting. But what it lacks in quality, it more than makes up in significance. This photo is important to my humans because it represents two big “firsts” in my life. This was the very first photo that appeared on my very first blog post in September 2012. My mommy helped me start a blog because she wanted to remember every single second of my life. Along the way, we’ve “met” so many wonderful people and pets and shared so many laughs and tears, good times and challenges, happy beginnings and painful endings. 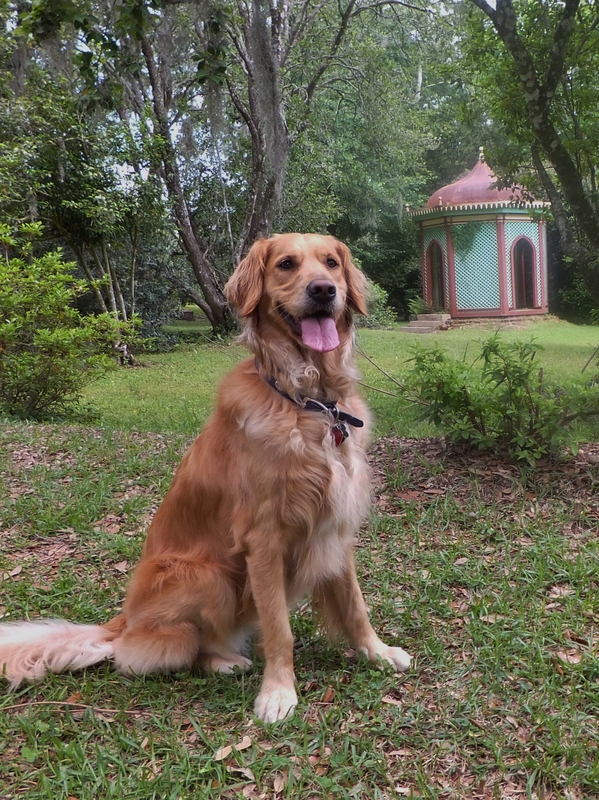 This photo is also important to my humans because it was taken during my first visit to Butler Greenwood Plantation and Bed and Breakfast in St. Francisville, La. We love to “get away from it all” at Butler Greenwood, where we can spend time walking in the field, sitting in front of the fireplace or outside on the porch, and generally doing nothing. 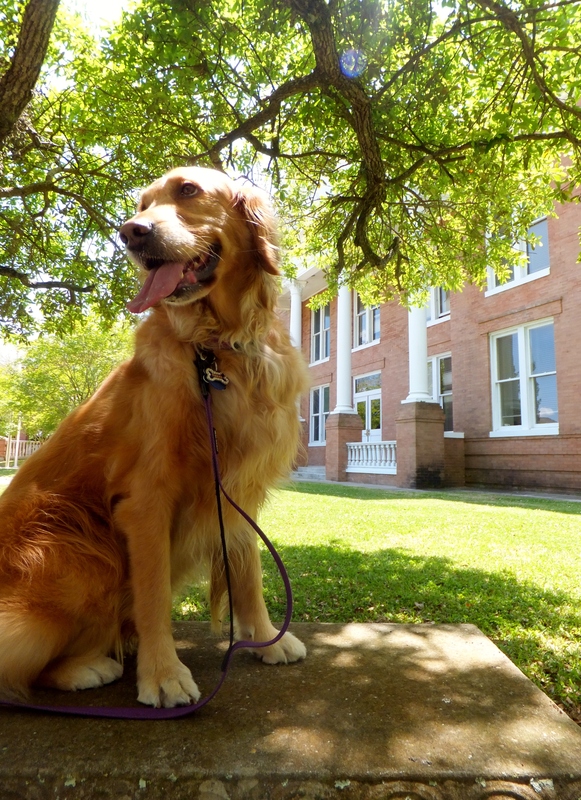 I love Butler Greenwood because I think it brings out my “inner bird dog.” Can you see that in this photo? As I near my fifth birthday, my humans and I look forward to many, many, may more “firsts”! A few weeks ago, my beautiful friend Misaki who writes The Misadventures of Misaki presented me with the Explorer Dog Award. This fun, new award was created just last month by Cat (a dog) from Camping & Exploring with Dogs. 1. 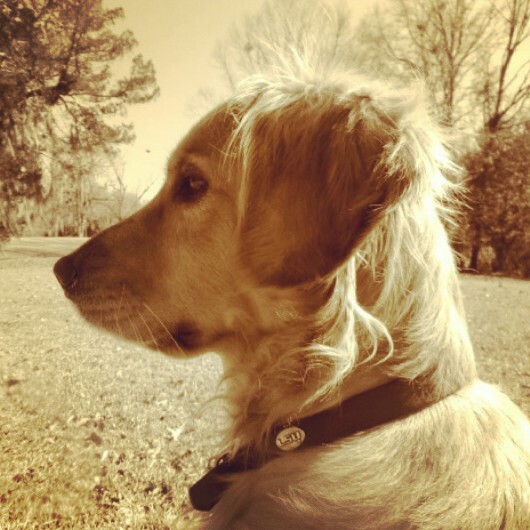 Link to the person (or dog) who gave the award to you and display it on your bloggy. Check! 2. Nominate up to five friends. Here they are! Bacon from Pig Love–Bacon is slowing but surely exploring the great outdoors, but his explorations within the Hotel Thompson are pretty exciting, too! Bacon isn’t a dog but, for the purposes of this award, I proclaim him an honorary dog. 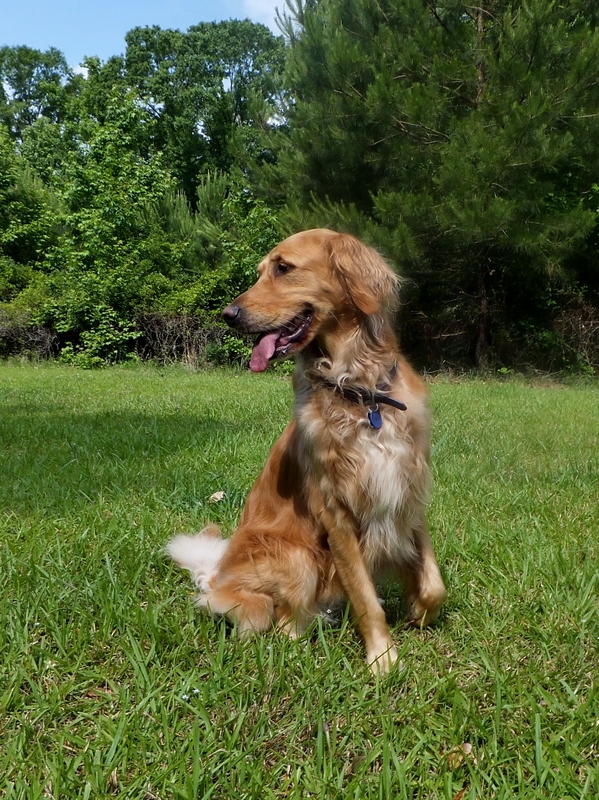 Matilda from Matilda’s Journey–This sweet girl has explored cancer treatment, which isn’t a fun exploration at all. But the good news is that she is doing very well and getting out to explore the sidewalks of Brooklyn. Roy from Following Roy–In the last few weeks, this little Aussie has gone from sandy beaches to snowy mountains. Now that’s some exploring! And he never left his home continent. Who knew Australia had snowy mountains? Ruby from Ruby the Airedale–Ruby is the funniest girl (or, as she would say, gurl) in all of blogdom, and she leaves the very best comments on everyone’s blogs. I would like to explore her mind, because I’ll bet that’s one fun place! Sage from The (mis)Adventures of Sage–This award should probably be called The Sage Award, because every day is a great exploration for this girl, and she never met a mud puddle she didn’t like. What is your favorite place to explore? Link to it. This one is just a little bit tough because I actually have two favorite places. Sometimes I like to explore in the city, and my favorite city to visit is New Orleans, Louisiana. 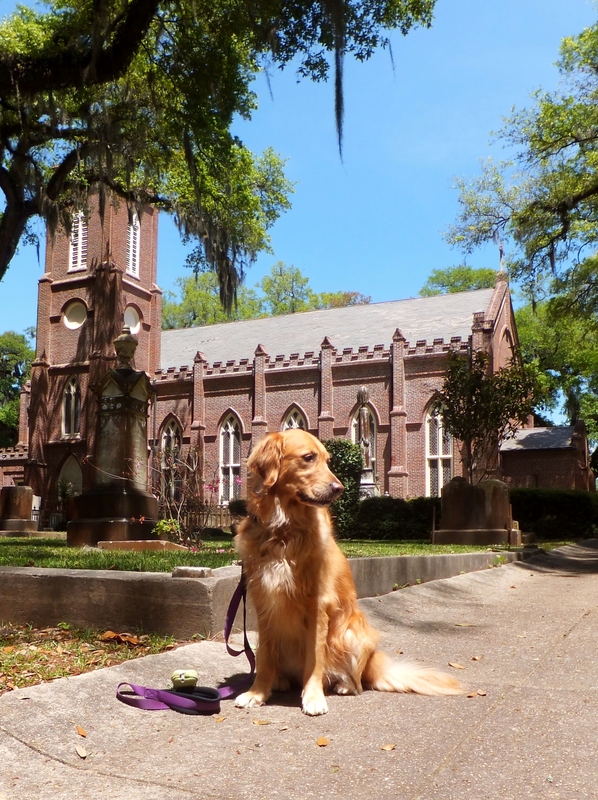 I have written several blog posts about my Crescent City trips, but you can click here to read about my most recent adventures this past April. 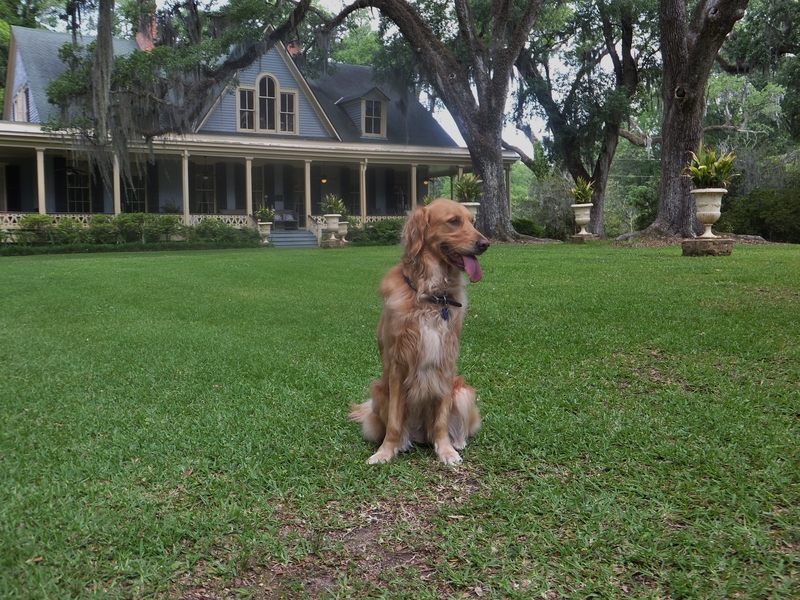 Other times I like to explore in the country, and my favorite country getaway is Butler Greenwood Plantation and Bed and Breakfast in St. Francisville, Louisiana. My last trip to Butler Greenwood was this past May and I had so much fun (you can click here to read more about it). I saw chipmunks and a peacock and baby birds and ducks and frogs and fireflies. And those were just the animals that I saw. You can only imagine all the things I heard and smelled early in the morning and late in the evening. Wow! I’m getting excited just thinking about all the exploring I did. As you can see, my explorations came to a screeching halt after May. That’s because it’s just too hot where I live for puppy dogs to do much in the summer; but my humans promise me that when the cooler temperatures return in October, I’ll be hitting the road again. I’m holding them to that promise. Have you ever found anything exciting/interesting whilst exploring? One time while I was exploring in New Orleans, I found a bar. Does that sound bad? Let me explain. My hotel was just around the corner from a place called The District, and every time we walked past it I tugged on my leash to go through the door. Finally, my mommy went inside and asked the bartender if I could just step inside to get it out of my system. 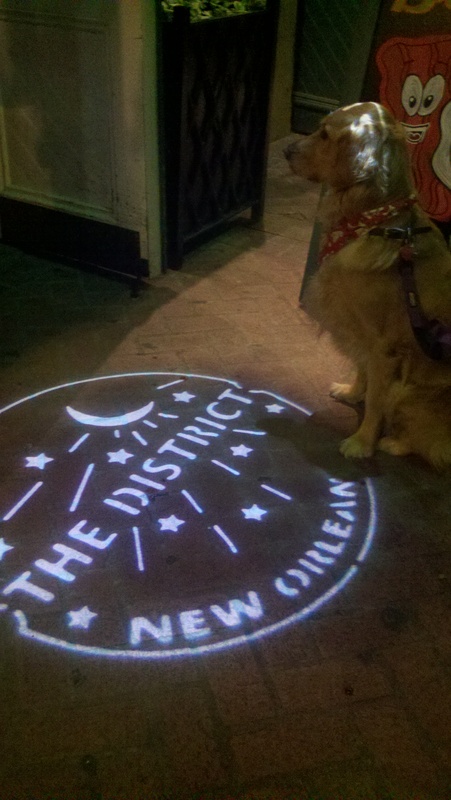 Well, turns out The District is a pet-friendly place (I was trying to tell my humans that) and I had a blast. It’s now a must-visit spot when I travel to New Orleans. What do you like to explore more, beach or park? Well, now you’ve hit a nerve. You see, I’ve never been to the beach. A beach trip is one of my goals, and it will happen, but it hasn’t happened yet. So, reluctantly, I must answer park on this one, because I have been to several parks and I have had fun. But I still want to go to the beach. What is your favorite post you have written? Link to it. “Visiting Hours at Squeaky Toy Hospital”–and, by the way, Hedgehog is still hanging in there! 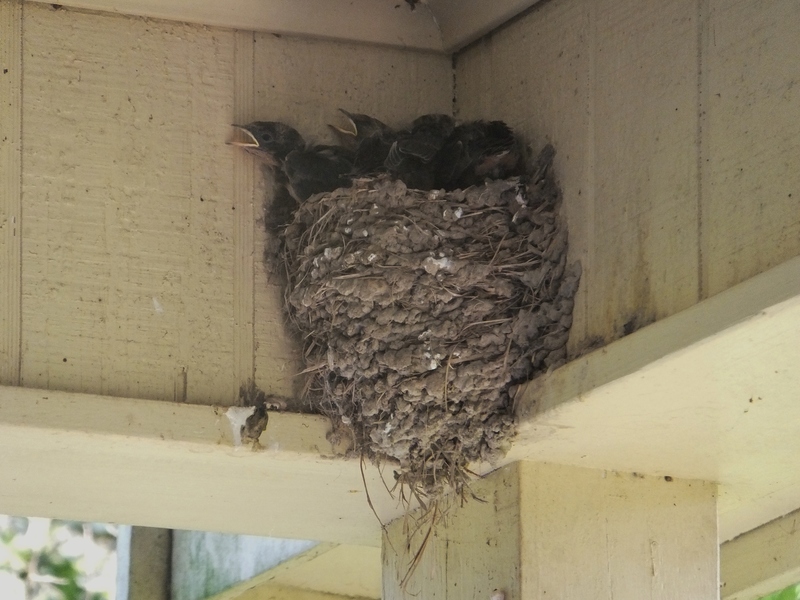 My marvelous weekend at Butler Greenwood Plantation and Bed and Breakfast continued bright and not-too-early Saturday morning when the baby birds outside of our cottage started demanding their breakfast. 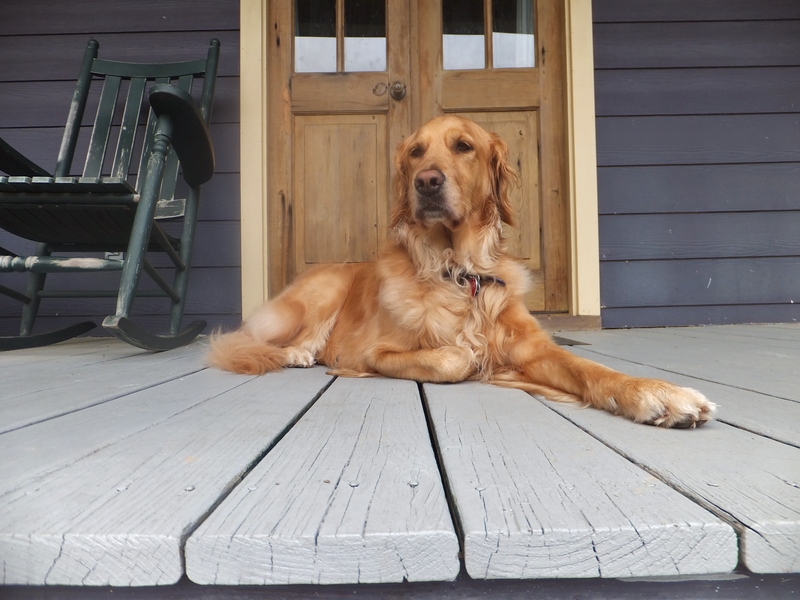 I joined my humans on the porch of Chase’s Cottage while they enjoyed their coffee and breakfast and we all eased into another relaxing day. 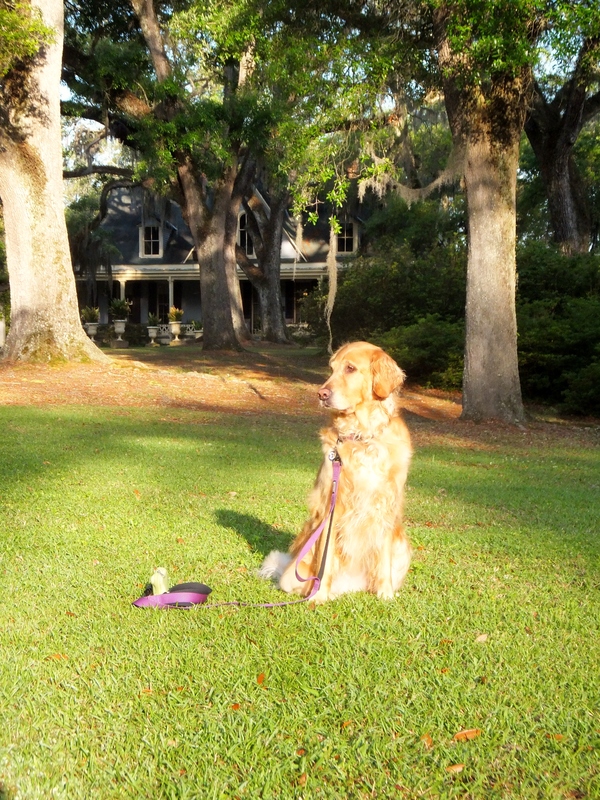 We enjoyed a beautiful walk in front of the plantation house. 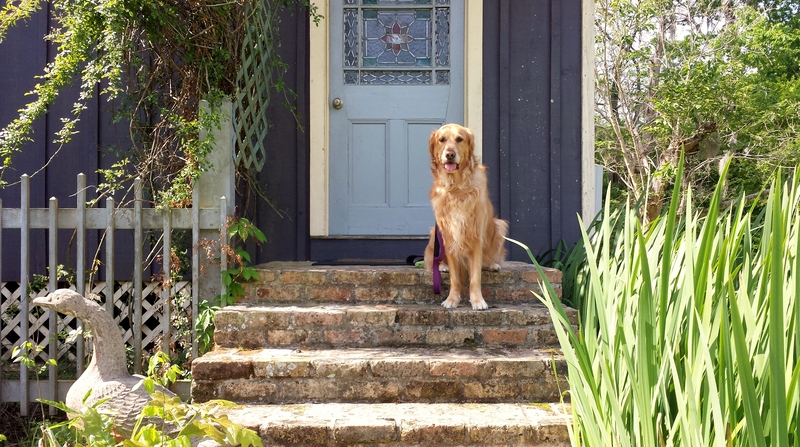 As I’ve said before, this was my third stay at Butler Greenwood, but this was the first time my humans trusted me off-leash in front of the house. This was a very big deal. Our fabulous picnic lunch was the highlight of the weekend for my mommy. My mommy loves a picnic, and this one was super special. We spread our picnic blanket (which is more of a tablecloth, but it’s what Mommy likes to use for picnics) in the shade of some beautiful trees outside of our cottage. 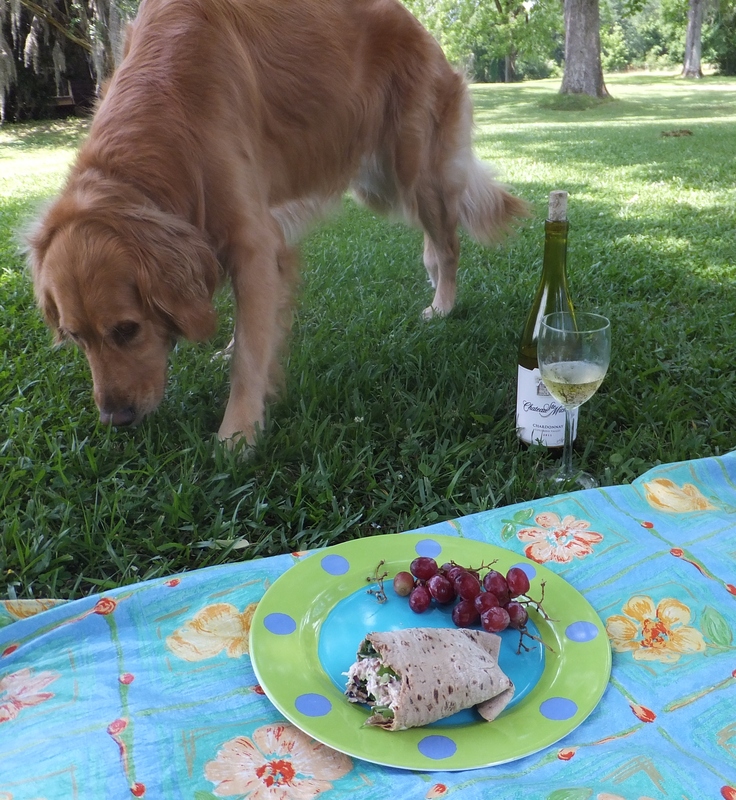 My humans enjoyed chicken salad wraps (prepared by my mommy), grapes, and, of course, a little wine. I enjoyed exploring my surroundings. After our picnic lunch, we all enjoyed relaxing on a beautiful early summer afternoon. My daddy found just the right spot to scratch me. Even my mommy relaxed, and that doesn’t happen very often. The afternoon just flew by, and suddenly it was time for our dinner. 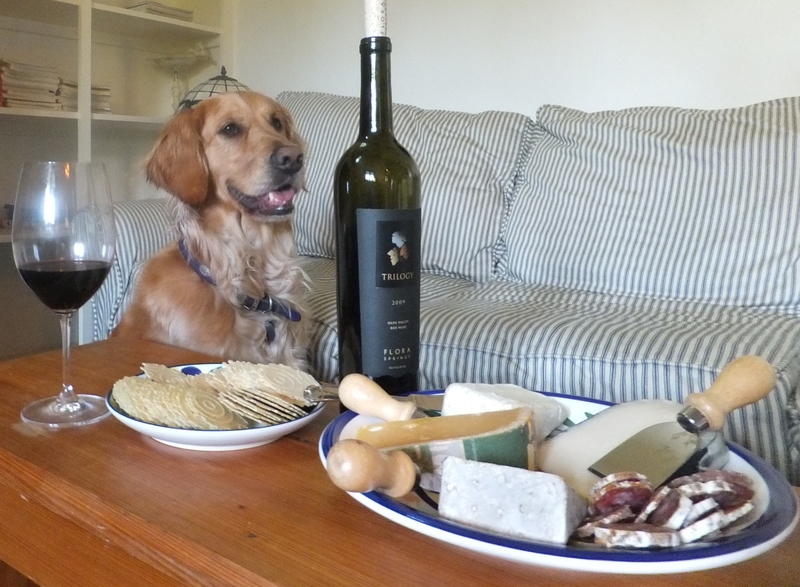 I had my usual dog food, but my humans treated themselves to a little wine and cheese. That’s when my mommy glanced out the window and saw Humphrey the peacock visiting our end of the pond. Naturally my mommy heard the call of the wild and dashed out the door to become a wildlife photographer. My daddy and I chose to stay inside. Daddy wanted to remain close to the wine and cheese, and I was simply too exhausted from my day to get up off of the nice cool floor. Sunday morning arrived much too soon. My humans explained to me that our wonderful weekend had come to an end. I was super, super sad at first. My weekend had been beyond magical. I saw ducks, peacocks, all sorts of bids, chipmunks, and even fireflies. 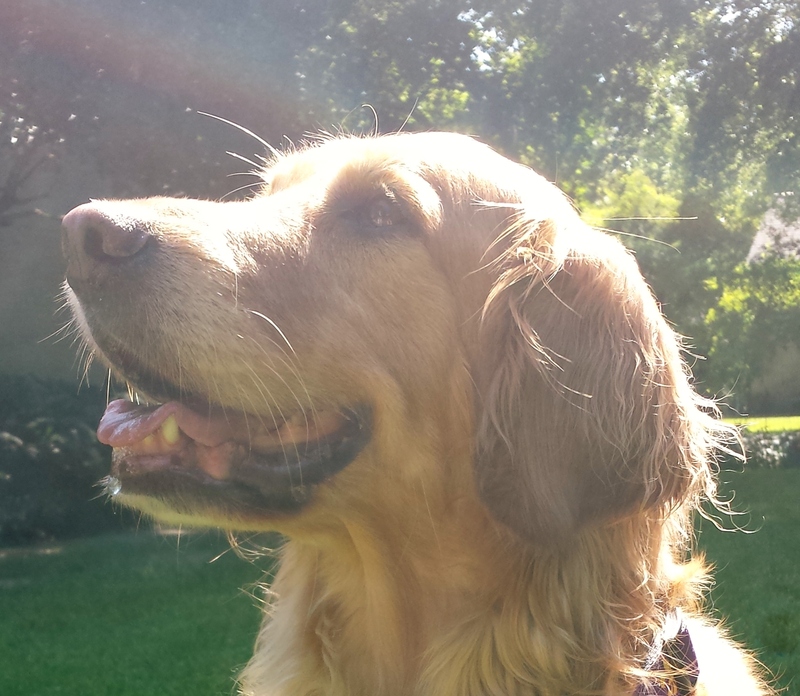 (Who knew a Golden Retriever could actually see a firefly? Trust me, I did; and to prove it my mommy has a nearly dislocated shoulder from the massive yank I gave to my leash.) I heard frogs, and frogs, and more frogs at the edge of the pond, and I smelled things that I can only imagine. 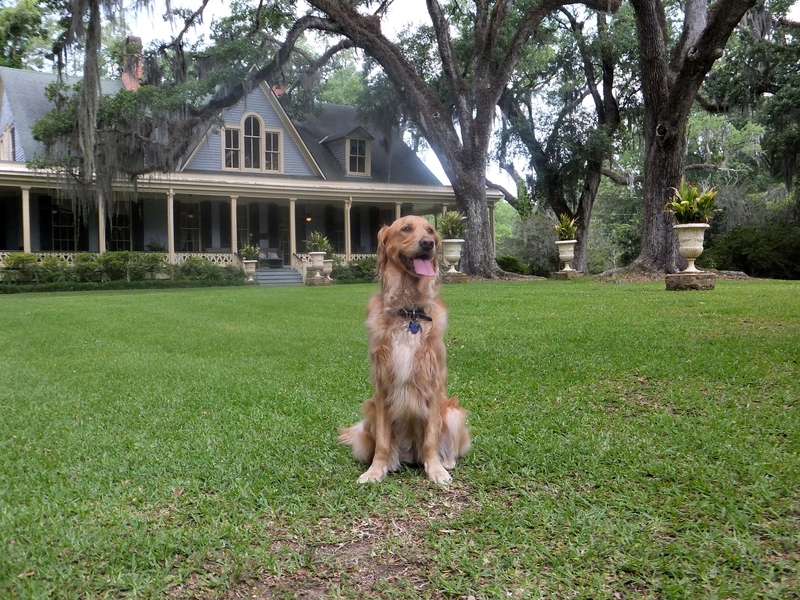 As we packed up and headed home, my humans promised me that we will return to Butler Greenwood Plantation and Bed and Breakfast very soon. I plan to hold my humans to that promise. Last Friday afternoon, my humans loaded my chariot (with, among other things, all that human food my mommy had prepared the day before, one of my beds and several toys that I would ignore for the next 48 hours, and a healthy supply of wine) and we headed to Butler Greenwood Plantation and Bed and Breakfast for a little rest and a lot of relaxation. Butler Greenwood Plantation is located in St. Francisville, Louisiana. It’s less than 45 minutes from my house, but it feels like an entire world away. This was actually my third trip to the B&B. The photo on my very first blog post was taken at Butler Greenwood almost a year and a half ago when I made my second visit. 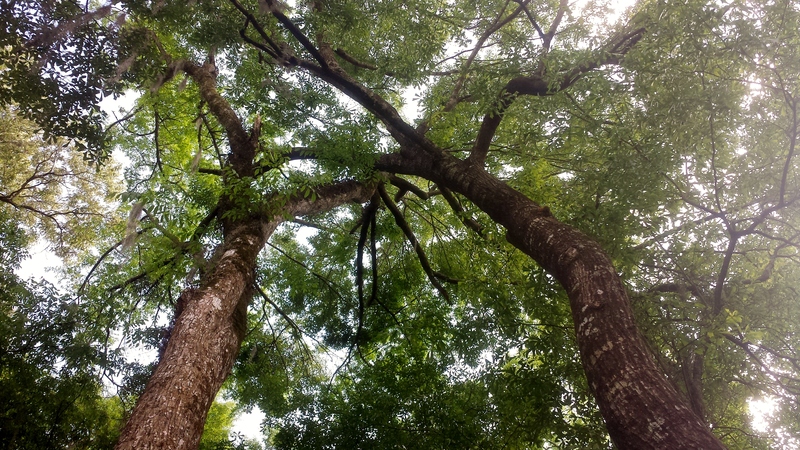 Butler Greenwood guests stay in eight cottages that are situated on the plantation’s beautiful grounds. 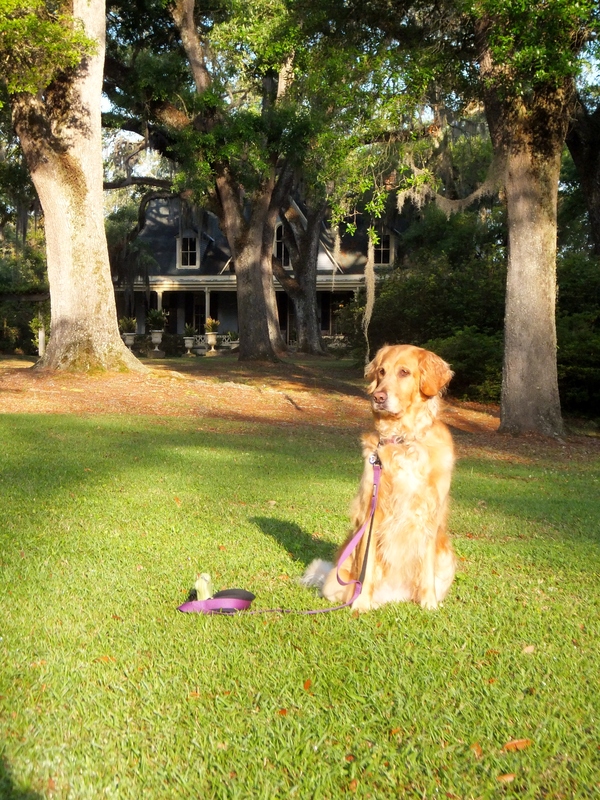 On our previous visits, my humans and I have stayed in The Treehouse, which features a three-level deck on a beautiful wooded ravine, and The Cook’s Cottage, a 19th-century building that was home to the plantation’s cook. 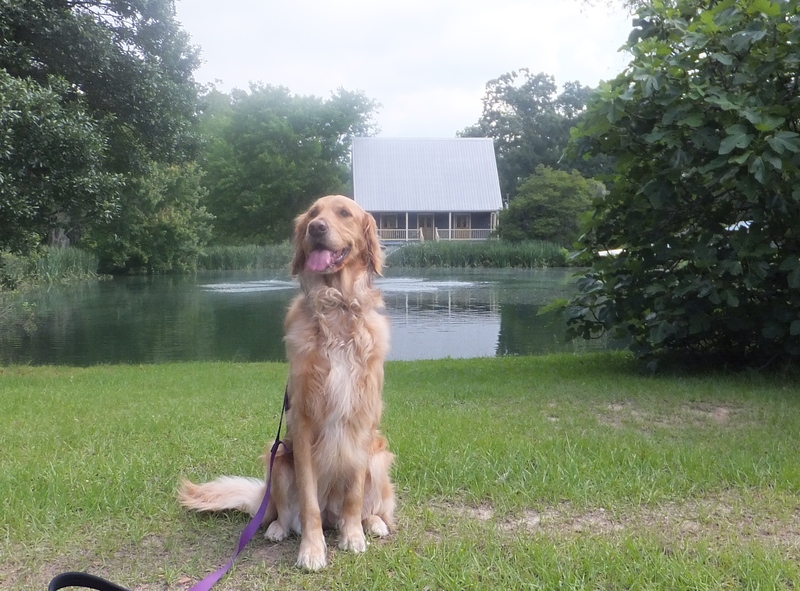 This time we checked into Chase’s Cottage, which is located on the edge of the pond and features a steep-pitched tin roof and a lovely porch that is perfect for a summer stay. My daddy unloaded my chariot, my mommy got everything settled, and then the three of us set out on our first walk through the big field behind the plantation home and cottages. 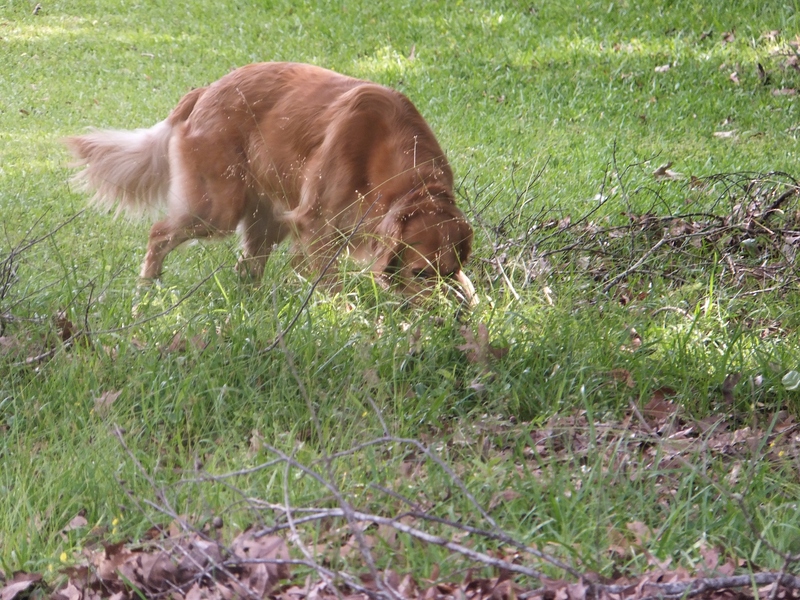 I love to run through that field . . .
. . . and to check out all the wonderful smells. It is heavenly. After our first walk through the field, we settled down on the beautiful, breezy porch where we would spend most of our time during this visit. We watched the activities in, on, and around the pond. My humans read books and magazines. My daddy and I dozed, and–of course–my mommy took lots and lots of pictures with that crazy camera. 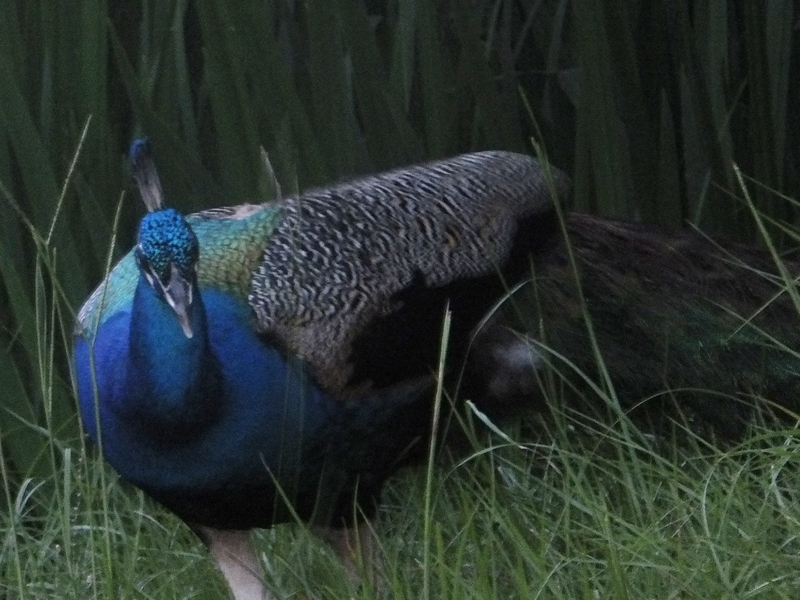 I was simply mesmerized by all the sounds–birds and baby birds, frogs of all sorts, ducks, and even a peacock who would entertain us with a lovely show later in the day. Some barn swallow babies, crammed into a nest that was safely tucked just beneath the porch’s ceiling, were our constant companions. 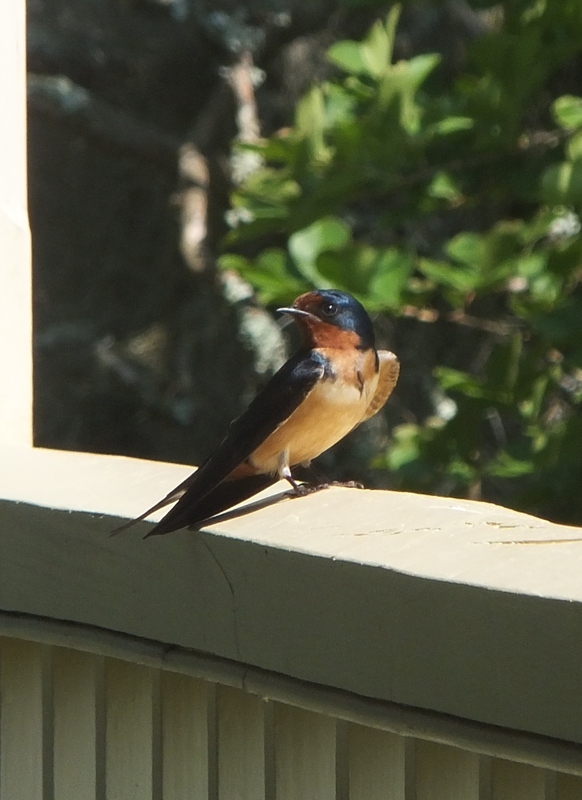 The adult barn swallows swooped from atop the porch lights, to the surface of the pond where they collected bugs, and then up to the little nest to feed those bugs to their babies. They rested briefly on the porch railing, and then started the process all over again. I watched the ducks on the pond and something deep, deep, deep inside of me said, “Hey . . . Harper Lee. Did anyone ever tell you that you’re a bird dog? 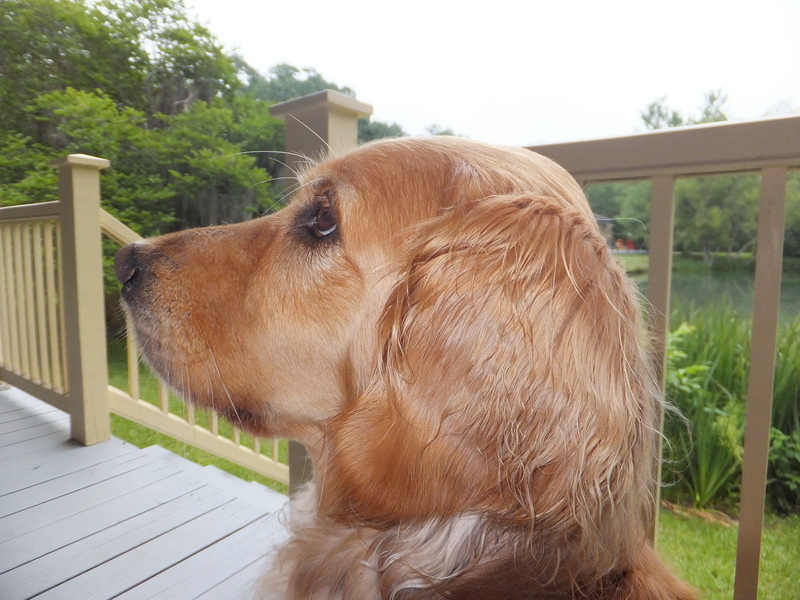 Did you know that somewhere way back in your past you had canine family members who actually retrieved those things?” I chose to ignore that crazy voice and just watched those pretty little ducks paddling from one end of their pond to the other and back again. 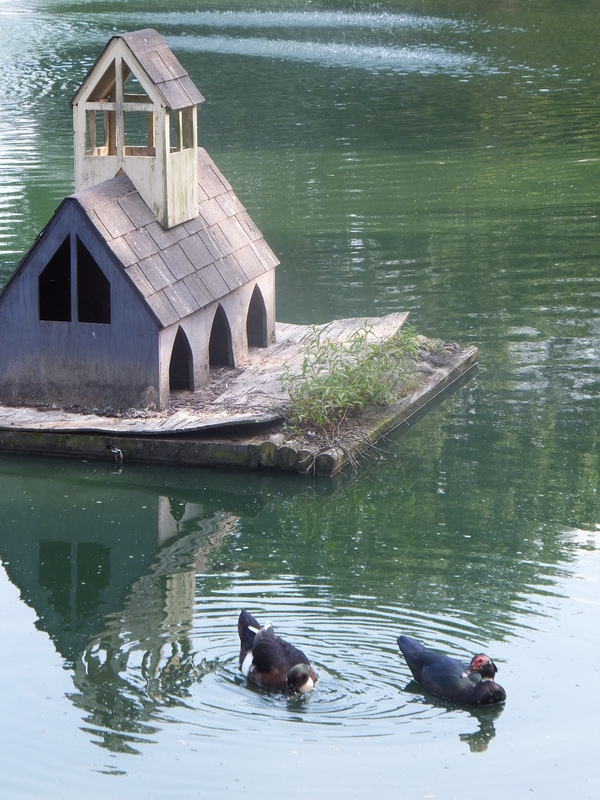 In the evening, they really did settle into their floating duck house for the night. 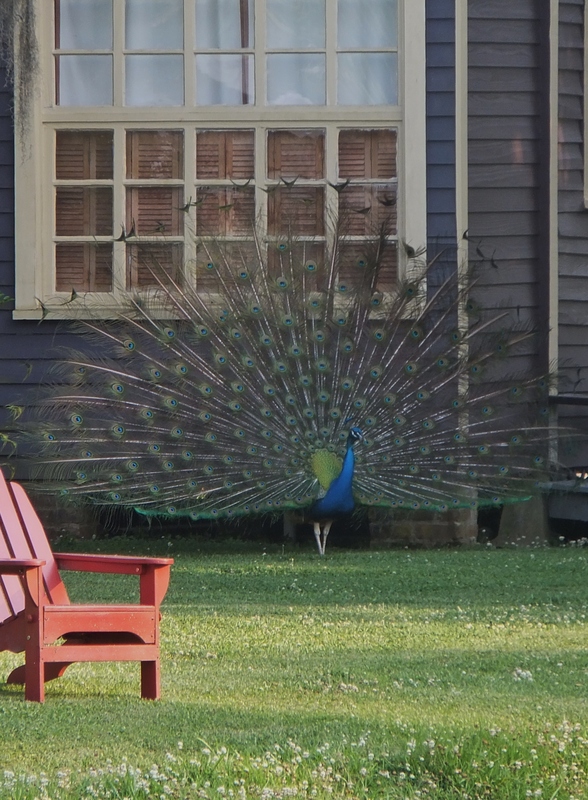 As my humans sat on the cottage porch enjoying a yummy early dinner pre-prepared by my mommy, they glanced across the pond and saw handsome Humphrey, the plantation peacock, performing his nightly show. He seemed quite pleased to have an appreciative audience. 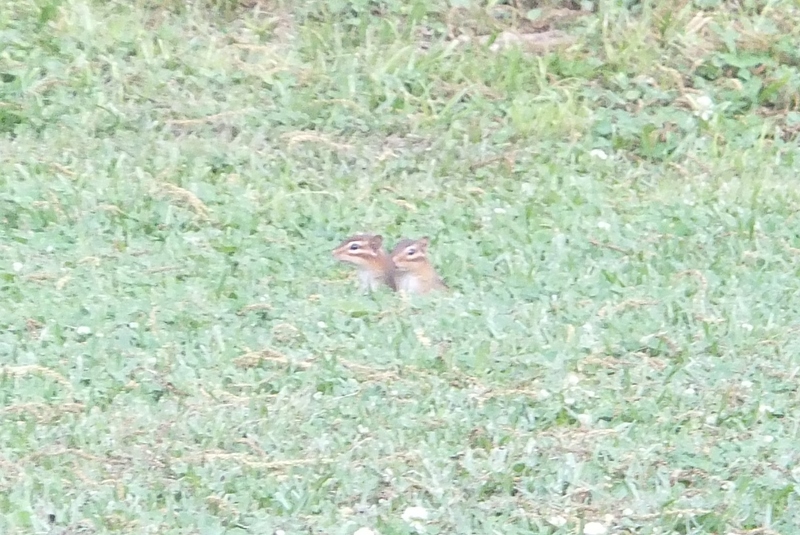 Our post-dinner wine stroll brought this cute surprise: two chipmunks peeking out of their little chipmunk home. If I used all four paws, I think I would run out toes to count all the different types of animals I saw and heard last weekend. It was magical. It was also a little exhausting. 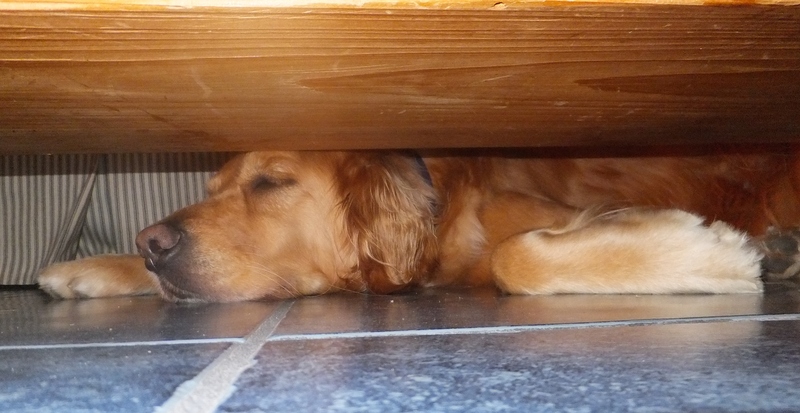 Back at Chase’s Cottage, I quickly dozed off. 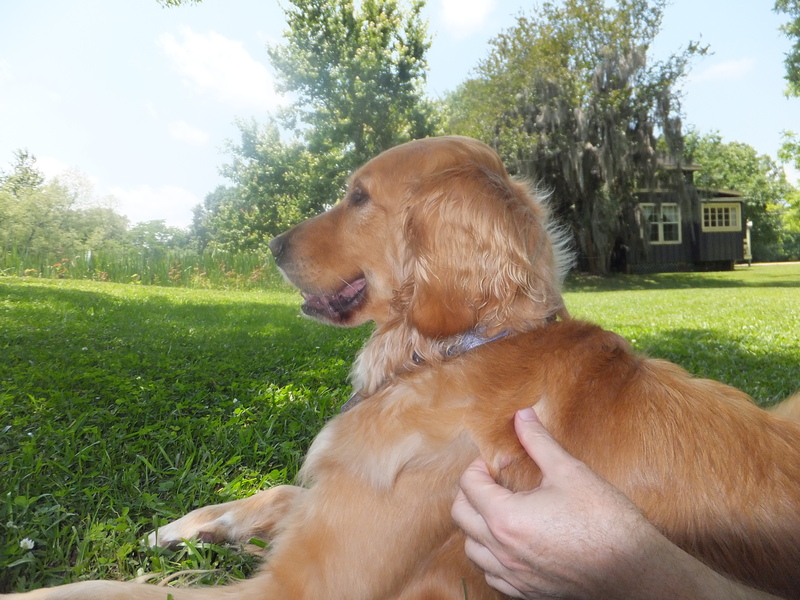 Let’s face it: Human rest and relaxation can be overwhelming for a Golden Retriever, and my humans and I would need our rest for the next beautiful day at Butler Greenwood Plantation and Bed and Breakfast.